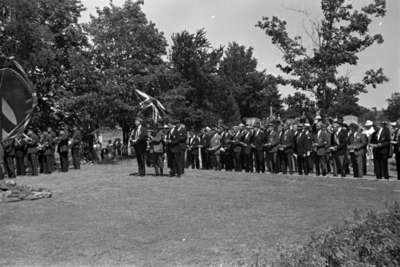 A black and white photograph of veterans, members of Legion Branch 112, with their colour party, lined up at the dedication ceremony at the Legion Plot in Groveside Cemetery. Dedication of cross at Legion Plot in Groveside Cemetery, 1936, Marjorie Ruddy. Whitby Archives 29-004-019.